The American economy is built on the illusion of hope rather than the foundation of economic reason. Our immediate, desperate need to balance the current budget, reduce the total deficit, and embrace profitability as the single most important financial fundamental is something that transcends political parties and narrow ideological interests. We must hold Washington accountable to this goal in every election. There are two caveats to be aware of in regard to this recent trend. The first is that the House’s budget has not passed and is therefore only a proposal at this point. Great harm can still be done by the more liberal Senate. The second caveat is that liberals all across America are outraged at the House’s attempt to reign in the entitlements championed and consumed by Democrats. Expect resistance. Who’s more credible when it comes to reducing the federal budget deficit, Barack Obama or Paul Ryan? 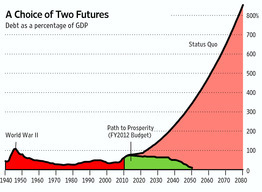 It should be no surprise that Mr. Ryan’s proposed plan is more financially responsible, to the tune of $4T. Now that’s change we can believe in. Read all about it. This is exactly what we’re talking about in the budget debate. If we have do choose, it should be an easy decision. 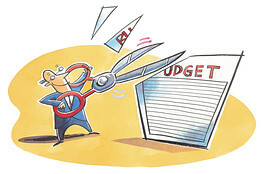 Now that the drummed-up budget controversy is over, here are my thoughts for the next one. There can’t be any sacred cows, period. I’ve been reading about the financial problems with Social Security and Medicare since I was 10 & bored enough to get past Humor in Uniform in Reader’s Digest. Now it’s time to pay the piper for 35 years of mismanagement, the inevitable result of allowing the government to take our money and put it into a politically managed investment portfolio rather than in a rational, market-based one. The bottom line is it’s time to save the country for our kids. 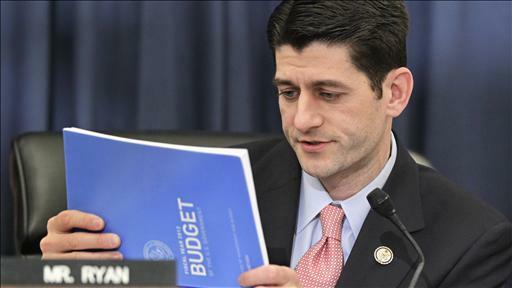 Steve Moore has the details on Rep. Paul Ryan’s plan to cut spending. 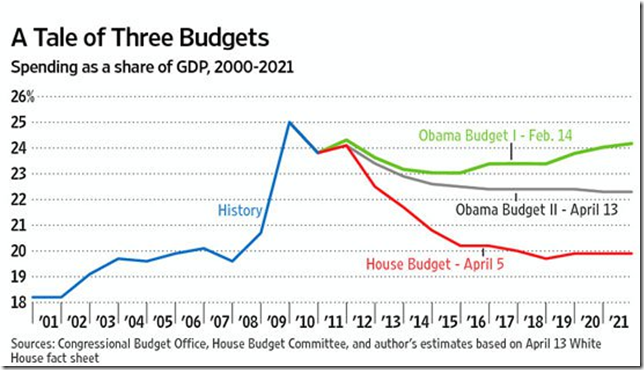 • Reducing spending: This budget proposes to bring spending on domestic government agencies to below 2008 levels, and it freezes this category of spending for five years. The savings proposals are numerous, and include reforming agricultural subsidies, shrinking the federal work force through a sensible attrition policy, and accepting Defense Secretary Robert Gates’s plan to target inefficiencies at the Pentagon. • Welfare reform: This budget will build upon the historic welfare reforms of the late 1990s by converting the federal share of Medicaid spending into a block grant that lets states create a range of options and gives Medicaid patients access to better care. It proposes similar reforms to the food-stamp program, ending the flawed incentive structure that rewards states for adding to the rolls. Finally, this budget recognizes that the best welfare program is one that ends with a job—it consolidates dozens of duplicative job-training programs into more accessible, accountable career scholarships that will better serve people looking for work. • Health and retirement security: This budget’s reforms will protect health and retirement security. This starts with saving Medicare. The open-ended, blank-check nature of the Medicare subsidy threatens the solvency of this critical program and creates inexcusable levels of waste. This budget takes action where others have ducked. But because government should not force people to reorganize their lives, its reforms will not affect those in or near retirement in any way. In addition, Medicare will provide increased assistance for lower- income beneficiaries and those with greater health risks. Reform that empowers individuals—with more help for the poor and the sick—will guarantee that Medicare can fulfill the promise of health security for America’s seniors. We must also reform Social Security to prevent severe cuts to future benefits. This budget forces policy makers to work together to enact common-sense reforms. The goal of this proposal is to save Social Security for current retirees and strengthen it for future generations by building upon ideas offered by the president’s bipartisan fiscal commission. • Budget enforcement: This budget recognizes that it is not enough to change how much government spends. We must also change how government spends. It proposes budget-process reforms—including real, enforceable caps on spending—to make sure government spends and taxes only as much as it needs to fulfill its constitutionally prescribed roles. • Tax reform: This budget would focus on growth by reforming the nation’s outdated tax code, consolidating brackets, lowering tax rates, and assuming top individual and corporate rates of 25%. It maintains a revenue-neutral approach by clearing out a burdensome tangle of deductions and loopholes that distort economic activity and leave some corporations paying no income taxes at all. This is America’s moment to advance a plan for prosperity. Our budget offers the nation a model of government that is guided by the timeless principles of the American idea: free-market democracy, open competition, a robust private sector bound by rules of honesty and fairness, a secure safety net, and equal opportunity for all under a limited constitutional government of popular consent. We can reform government so that people don’t have to reorient their lives for less. We can grow our economy, promote opportunity, and encourage upward mobility. 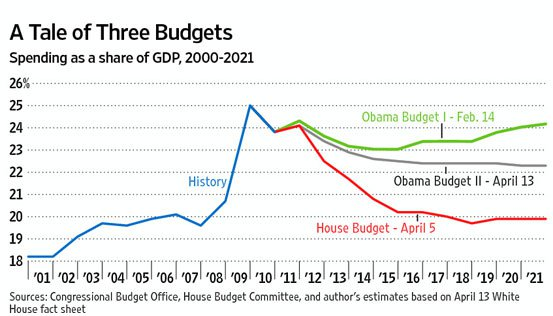 This budget is the new House majority’s answer to history’s call. It is now up to all of us to keep America exceptional. Sounds like good sense to me. This man deserves our support and we need to get something very much like this plan to be passed. Get involved, write your representative, and let’s make them do what’s good for all of us, including our children and grandchildren! The Spectator: “[Mitch] Daniels is seen as someone engaged with policy details who can go beyond trite Obama-bashing and deliver a critique of federal spending that isn’t limited to wisecracks about earmarks. An objective examination of this line of thinking reveals that nothing could be further from the truth. Now consider the store manager. She could easily do the flipper’s job – probably has done it in the past, in fact – as well as any other job in the store. Indeed, her ability is probably better at each and every position in the store than the people who hold them. Her value is clearly greater than the flipper’s. Let’s estimate it as 25, or 2.5x the flipper’s. Debatable, but reasonable, I think, given my personal experience as the flipper. Now, consider a highly-trained bio-chemist whose work in generating a sustainable, cost-effective algae-based energy source fundamentally alters the western world’s relationship with the OPEC nations. What’s his value relative to the McDonalds store manager? Infinite, in reality. Even if we set it at 100x, that gives the chemist an overall relative value of 2500. In any rational system of employment and compensation, a person’s earnings should reflect their value relative to other workers. The ground-breaking bio-chemist in the scenario above should earn at least 500 times more than the burger-flipper because the value he provides to the world is infinitely greater. 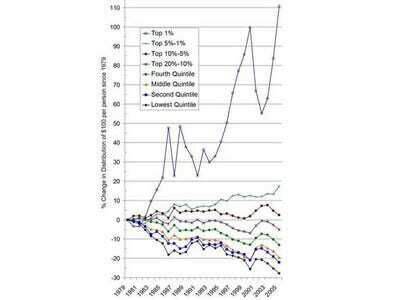 In fact, income inequality is reflective of capability inequality. If one believes that income inequality should be removed from society, the proper way to do so is not to levy taxes, steal from those who produce wealth, and redistribute the booty to liberals’ constituents. The right approach would be to eliminate the capability gap. Unfortunately, this requires the participation of those at the bottom end of the economic scale, something that’s not been forthcoming. On one level, this lack of interest in changing economic lanes is understandable because it’s not something that can be done immediately. Rather, improving capabilities requires sacrifices of time, money, leisure, and style. There’s nothing fun about buckling down to get an education; however, there’s no substitute either. Every person in America has the opportunity to get a quality education. Unfortunately, far too many squander their own chance at economic mobility (and do fatal damage to others’ at the same time) because they simply are unable to comprehend the value of what they are giving up. 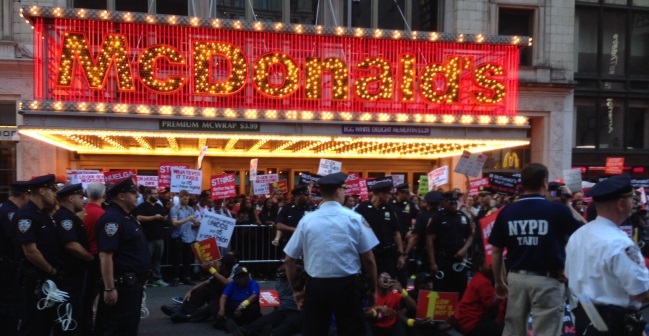 For those who do, it’s obvious that income inequality equates to opportunity. Why would the bio-chemist spend years in school, honing his mind to levels unimaginable by the burger-flipper, in order to receive a salary identical to that of his value-inferior? He wouldn’t, of course, because there is no reason to work hard for success if victory brings no reward. 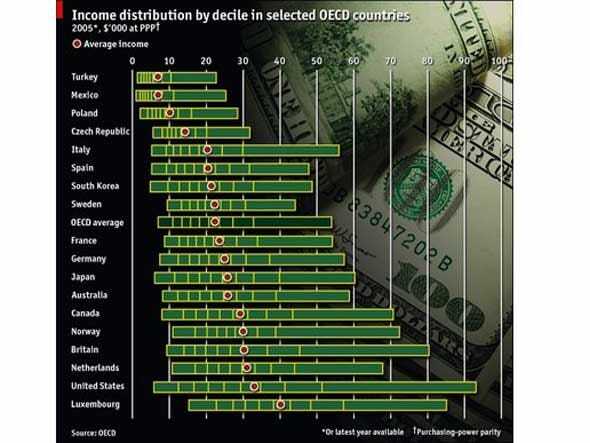 The fact that the United States has a wide distribution of incomes demonstrates that there is an opportunity for people who work hard to succeed far beyond the imaginations of most men and women. This is as it should be, for it’s an American imperative to produce over-achievers at a higher rate than the rest of the world. That is, after all, the only way that we can continue to lead nations such as China and India whose larger populations give them an inherent competitive advantage. If there is a problem with income inequality, it’s that possession of wealth can lead those who have it to game the system in order to keep accruing larger and larger piles of money without actually producing anything of value in return. It goes without saying that criminal activities such as fraud, insider trading, tax evasion, and other abuses of the system should be actively discouraged, not because they cause income inequality but because they destroy the integrity of the system of opportunity Americans have as their birthright. It is this system that matters, not the particular result at any point in time, and it is this system that post-modern liberalism, with its excessive emphasis on removing inequalities of every sort, attacks and undermines at every opportunity. Far from criticizing the inequality of incomes in the U.S., we should celebrate them, for the gap indicates that the system of free enterprise envisioned by the Founding Fathers as the economic engine of this country is still firing on several cylinders, despite liberal policies that have markedly reduced the efficiency at which we are allowed to operate.